Roll to Roll Coater/Dryer RT-350M/RT-B350M | SCREEN Finetech Solutions Co., Ltd. This system is able to coat and dry electrocatalysts directly onto the electrolyte membranes of polymer electrolyte fuel cells (PEFC). Since its launch in 2016, it has been widely adopted for use in fuel cell production lines. 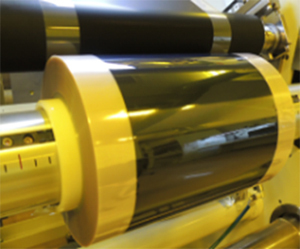 With this production method, catalyst ink is coated and dried directly onto a continuously fed roll to roll electrolyte membrane using slit (die) coating. The catalyst layer and electrolyte membrane combine to form a catalyst coated membrane (CCM) for fuel cells. We began developing direct coating technologies in 2013, with assistance from the New Energy and Industrial Technology Development Organization (NEDO). While it had proven difficult to apply the catalyst directly onto the membrane, we successfully overcame this issue by utilizing technologies and expertise built up during the creation of our coater/developer systems for displays. ・The entire process is roll to roll, dramatically reducing the production time for each cell. ・The processing rate is more than 10 times faster than with conventional decal and spray coating methods. ・The elimination of press processing improves gas diffusion, leading to better cell performance. ・Extremely thin membranes can be formed, reducing membrane resistance and further raising cell performance. ・Our highly precise intermittent coating process ensures virtually 100% efficiency in the use of expensive membrane and platinum catalyst materials. ・Coating of the catalyst ink is performed using completely sealed slit nozzles, preventing quality changes or deterioration in the supply circuit. ・Unlike the decal method, expensive consumable parts and materials are not required. ・Inspection systems are installed inline to measure factors including platinum loading and electrode dimensions and to check for defects. ・Traceability management can be performed for all cells.